Today I want to go through some of the supplements for Hollow Earth Expedition. Each of these adds something I think necessary and needed to the game. I won't lie. I really, really like this book. I am reviewing the PDF at 167 pages. Secrets of the Surface World is the guide for all characters really. There is a lot going on *on* the Earth without ever having to go *in* to it. Chapter 1 covers Characters. Here we have a host of new archetypes, motivations and skills for your characters. The big add here is the inclusion of Martial Arts and Brawling skills. So now you can make your own "Kwai Chang Caine" character. Though for me the jewels are in the Talents. Here we have Magical Aptitude and Psychic Ability. Personally I think these should have been in the core book, BUT I do see why they are here. HEX is really more about science, or more often SCIENCE!, and magical powers don't really help that. But I am sorry I just love to see magic in my games. Don't worry, fans of Weird Science have plenty to look at here as well. There are more Resources as well. Flaws are also covered, but so are Severe Flaws. These are obviously worth much more. We are also given Mental Flaws. Plenty of Role-playing fun with these. Chapter 2: Supernatural Powers is why I got this book to begin with! Yeah, I like a certain kind of game and this chapter turns HEX into that kind of game for me. The Supernatural powers are divided up into Psychic Abilities and Magic. The system is pretty straight forward to be honest. Psychic abilities are divided into various talents, each one must be purchased separately. Magic is a single talent, though there are different Traditions, and a skill. Spells and Rituals must be uncovered or found. Not a lot of magical traditions and spells are given, but there is enough for me to take it and run with it. Chapter 3 Secret Societies continues where the HEX core left off. Everything from the Thule Society to the Mafia are covered here. Like the core some NPCs are also presented here. My favorites are Aleister Crowley and Edgar Cayce. It is a great contrast to see the two different supernatural styles together. Chapter 4 The Surface World covers more parts of the world not touched on in the core book. Chapter 5 T. F. Arkington's Lifestyle Emporium covers more gear. A lot more gear. Chapter 6 Weird Science. I said there was going to be more for the fan of Weird Science and I meant it. Want to send giant Nazi mechs against your characters? Ok. We can do that now. Really. Chapter 7 Vehicle Combat continues the material from the Core book. Though more detail is given. In truth you might not ever need this chapter since the core covers it so well, but it is nice to know it is here. Finally we end with a sample adventure Prisoner of the Reich. All in all a satisfying book. I can't help but think that some of this should have gone into the core book, but the magic stuff is so different than the rest thematically I see why it wasn't. I got this for the magic, so I am pleased with that. I have so many plans for this book. Like Secrets of the Surface World is for well, the surface world, this book is all about the Hollow Earth. Create native characters from all over (under) the Earth. Chapter 1 again deals with Characters. At this point you know how this all set up. New Archetypes include Barbarians, Beastmen, Guardians, Healers, Mystics, Natives, Outcast and Warriors. One thing should be pretty obvious now, not only can you use this for a Pellucidar-like game, but it sets up a Barsoom game nicely or even a Conan/Hyborean Age game. 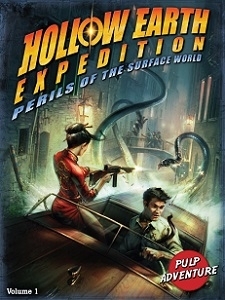 A Pulp game in a Pulp setting, how nice is that! There are some new motivations, and plenty of new talents. There are also some new flaws. This book feels more like a true supplement rather than a book of "left-overs"; some thought and research went into this. I was reading through it all and mentally substituting things I had read from Edgar Rice Burroughs or Robert E. Howard. That's a good sign. Plus you can mix and match talents to create Panthermen, Hawkmen, Reptile-people (always a plus in my book) and dozens of others. The pre-gen Archetypes are great. The Amazon Warrior makes me want to play a Xena like game now. Chapter 2 takes us back to Supernatural Powers. We start with more details on sorcery including more modifiers. We also are given Shamanism and Alchemy which is really cool. This chapter plus it's twin in Secrets of the Surface World gives me no end of ideas. Chapter 3 covers Natives. This is a great and fun chapter to be honest. If anyone asks me why run a game in the Hollow Earth I am directing them to this. It is an odd mix of Pulp, post-Victorian occultism and fringe science. I love it. I have seen other games take the same elements, but the assembly here is fantastic. Is it the only way to do this? No, the same elements appear in many other games (Amazons, Atlanteans, lost titans...) but here it works rather nice. Chapter 4 Beastmen covers the others living in the Hollow Earth. Natives are largely human, beast men are something else. The usual suspects are here; Apemen, Gillmen, Lizardmen, Molemen (natch), and Panthermen (or at least a cat-like humanoid race) but there are some great newcomers like the not often seen Hawkmen (should be more Egyptian in my tastes but hey, happy to see them) and some insectmen and the new for this genre Green Men which are more plant like. Chapter 5 covers the Hollow Earth. It includes some basics (healing, getting out) but mostly devoted to various locations. Atlantis for example is here, as is El Dorado (the City of Gold), Shangri-La, and Blood-Bay where the Pirates hang out. That is enough to keep you going for a while really. Chapter 6 adds a more monsters to the Bestiary. There are more dinosaurs here (always welcomed!). There are prehistoric reptiles that are not dinosaurs, such as the Archelon and the Plesiosaurus among others. The science geek in me appreciates the separation. We also get a great collection of prehistoric mammals. Giant insects, giant apes, and other creatures fill this section. There is even a guide for creating your own creatures. Which is good, because the one monster I wanted wasn't there. The book has plenty of pictures of Dimetrodon, but no stats. I might have to make my own now. We end with a sample adventure, Fate of Atlantis and an Index. There is so much here that any half-decent GM could find hours and hours worth of game materials for their own Hollow Earth games. This is a collection of adventures that takes the characters around the world. Adventures are harder to review than games in general since the real proof in both is the playing. Adventures only more so. This book contains four separate, but loosely connected adventures. Each one also contains some added crunch or rules to the game. We get Faith and Miracles, Horror, Infection and Sanity, New Sorcery Rituals, Artifacts and Vehicles and lastly (what might be the most fun) some Martial Arts powers. No spoilers, but if you need some ready to go adventures then this is the book you want.